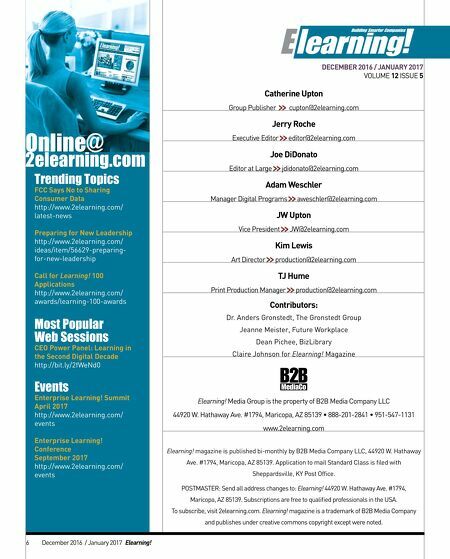 DECEMBER 2016 / JANUARY 2017 VOLUME 12 ISSUE 5 Catherine Upton Group Publisher >> cupton@2elearning.com Jerry Roche Executive Editor >> editor@2elearning.com Joe DiDonato Editor at Large >> jdidonato@2elearning.com Adam Weschler Manager Digital Programs >> aweschler@2elearning.com JW Upton Vice President >> JW@2elearning.com Kim Lewis Art Director >> production@2elearning.com TJ Hume Print Production Manager >> production@2elearning.com Contributors: Dr. Anders Gronstedt, The Gronstedt Group Jeanne Meister, Future Workplace Dean Pichee, BizLibrary Claire Johnson for Elearning! Magazine Elearning! Media Group is the property of B2B Media Company LLC 44920 W. Hathaway Ave. #1794, Maricopa, AZ 85139 • 888-201-2841 • 951-547-1131 www.2elearning.com Elearning! magazine is published bi-monthly by B2B Media Company LLC, 44920 W. Hathaway Ave. #1794, Maricopa, AZ 85139. Application to mail Standard Class is filed with Sheppardsville, KY Post Office. POSTMASTER: Send all address changes to: Elearning! 44920 W. Hathaway Ave. #1794, Maricopa, AZ 85139. Subscriptions are free to qualified professionals in the USA. 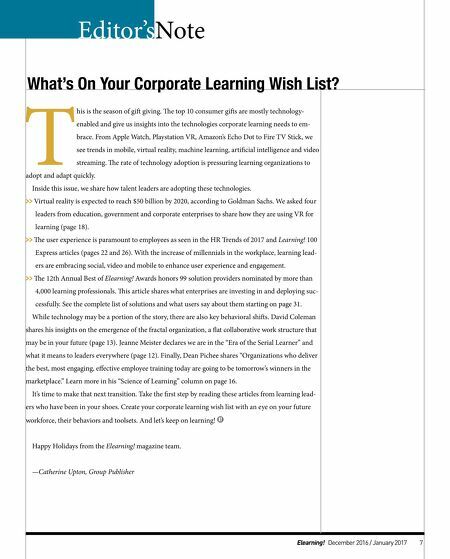 To subscribe, visit 2elearning.com. Elearning! magazine is a trademark of B2B Media Company and publishes under creative commons copyright except were noted. Online@ 2elearning.com Trending Topics FCC Says No to Sharing Consumer Data http://www.2elearning.com/ latest-news Preparing for New Leadership http://www.2elearning.com/ ideas/item/56629-preparing- for-new-leadership Call for Learning! 100 Applications http://www.2elearning.com/ awards/learning-100-awards Most Popular Web Sessions CEO Power Panel: Learning in the Second Digital Decade http://bit.ly/2fWeNd0 Events Enterprise Learning! Summit April 2017 http://www.2elearning.com/ events Enterprise Learning! Conference September 2017 http://www.2elearning.com/ events 6 December 2016 / January 2017 Elearning!